TT from the M50 bridge just past Taylors 3 Rock pub to the top of the 3 rock (well the end of the tarmac anyway). 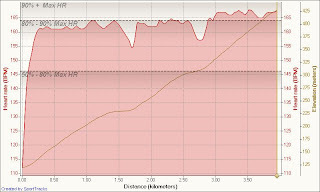 of 8.1% (with 2 flat sections - feels more like 10% average) and 318 metres of climbing. before, never mind one that had you spending most of your time pointing skywards! I arrived early and did a quick spin up to Ticknock to wake up a bit (baby awake a lot of the previous night meant I was a little worse for wear). I've also been doing a lot of cycling in and out of work these days for money saving and training, so the legs were a little sore too. We had about 9 at the start line, with myself,Sean, Cait and Ryan from MAD and the rest from Boards.ie. Mel was time keeper for the event. With everyone leaving in 1 minute intervals, I was the 8th person off (or there abouts). After the warm up I decided the big ring was going to be off limits for most of the run, and instead would try to keep it in a big gear at the back. 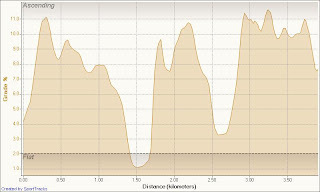 To be honest the run itself was boring - not like an mtb race where you have climbs, drops, singletrack to keep your mind occupied. What made it interesting is the mental focus and trying to keep the pace up and not giving in to the negative thoughts that float around your mind like hoping for a puncture/spoke to break etc. I passed Cait first (who was on her mountain bike in fairness! ), then a couple of the boardies, and made it to the top in 15 minutes and 16 seconds, which was the 2nd fastest of the night, with Ryan first at 12.34 and Sean just behind me at 15.21. 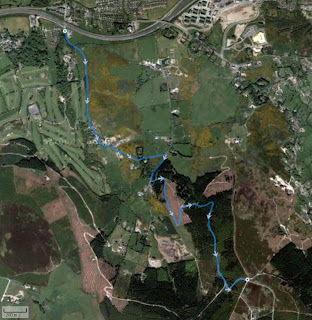 I did slow up at the end so I may have given up a few seconds there but that was as good as I could do on the night. Despite the pain, I really enjoyed it. Its just a different way to push yourself up a hill fast. Sure you could do it by yourself, but knowing there is a person 1 minute behind and ahead of you is very motivating. Ryan is talking about running another one in a couple of weeks, but this time maybe up Cruagh, so I'll be out for that too. Those hillclimbs are 50% physical, 50% mental. It really is hard staying positive and drilling it even when you want to fall off the bike. Yeah, I'm keen to get out and give it another lash soon. Can defo take a few seconds off it :) Thanks again for organising.